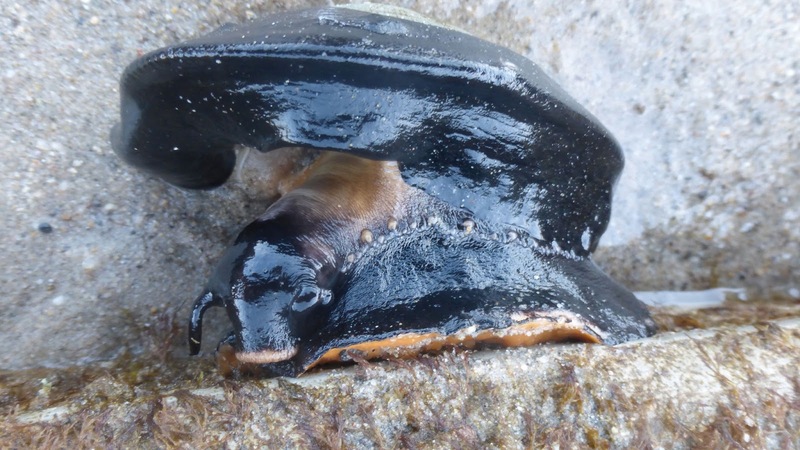 All summer long, the tabloids and gossip columns are full of Malibu celebrity sightings, but here's a really big celebrity (or possibly a sea-lebrity) that's been overlooked: Aplysia vaccaria, the California black sea hare, a mild-mannered sea slug that has the distinction of being the world's largest gastropod. Eat your heart out, Orlando Bloom. Unless otherwise noted, all photos are © 2016 S. Guldimann. Were you aware, dear reader, that the Malibu coast is currently playing host to large numbers of the world’s largest gastropod? 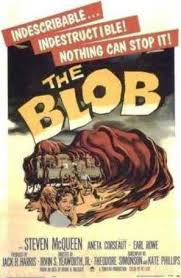 While that sounds alarming like the plot of a 1950s B movie, this celebrity among slugs is a peaceful vegetarian, despite a passing resemblance to that movie monster favorite, The Blob. 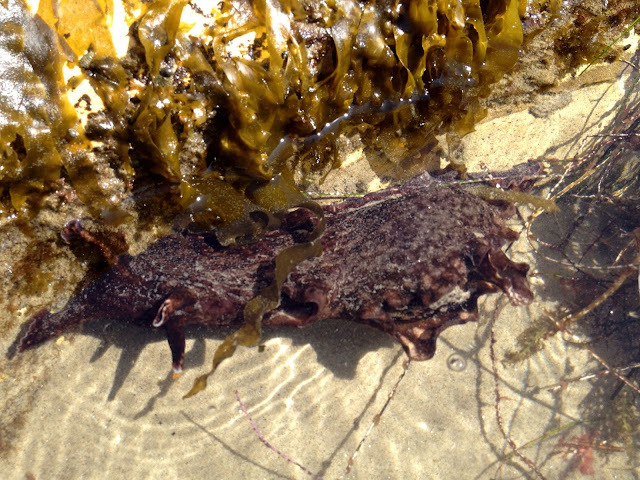 While the California brown sea hare, Aplysia Californica, is a regular tidepool resident in Malibu, this year, its much larger relative, Aplysia vaccaria—the black sea hare—is turning up in large numbers. No one at the Malibu Post can remember seeing more than one or two black sea hares. It's unclear if the vast number showing up this year is related to the unusually warm water or if other factors are in play. Brown sea hares are smaller and usually a lighter color than their giant relative. Both species graze on kelp, which they chew up with a rasp-like tongue called a radula. Sea hares get their name from their rabbit ear-like appendages—actually scent organs called rhinophores. Brown sea hares can grow to be impressively large for a slug, often measuring more than 15 inches from nose to tail. A. vaccaria, however, can grow to be more than three feet long and weigh as much as 30 pounds. That’s one big slug. The largest specimens rarely turn up in the intertidal zone, but this year’s Malibu crop of A. vaccaria is still impressive, resembling a football in size and shape. This unfortunate slug was left high and dry by the receding tide. However, sea slugs have adapted to the extreme conditions of the intertidal zone and can survive several hours out of water even in bright sunlight during low tide. The holes in the rock near this slug's head measure about an inch across, giving an idea of the creature's size. 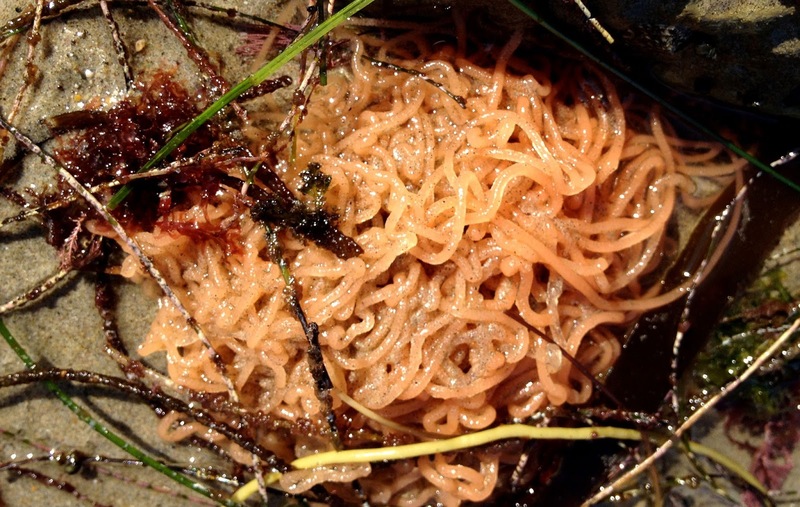 Sea hare eggs look exactly like noodles, but probably would not be pleasant to eat. Both California species contain toxins from their algae diet that make them inedible to almost everything except lobsters—the garbage crew of the sea—and green anemones, which appear to be immune. 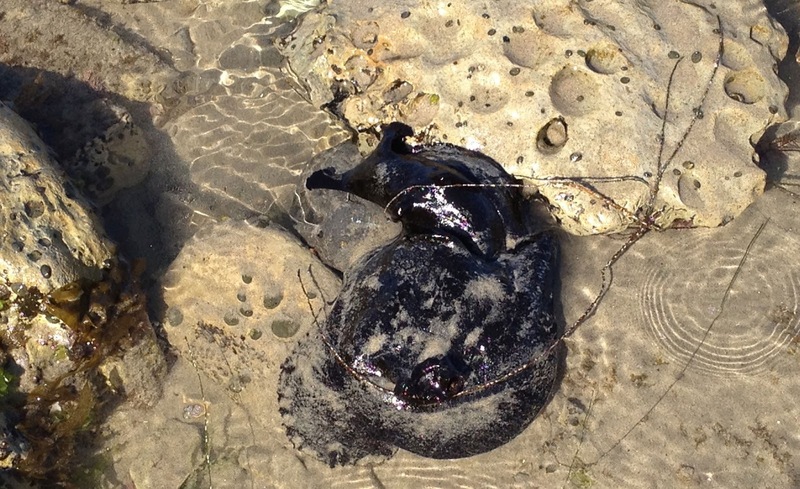 There's a type of Australian sea hare that is so toxic that dogs have died after coming into contact with it. California sea hare species are much less potent, but it's a good idea not to handle them and to keep dogs away from them. Brown sea hares can release a purple dye that is a skin irritant. Black sea hares appear to depend on their terrible toxic taste for defense. 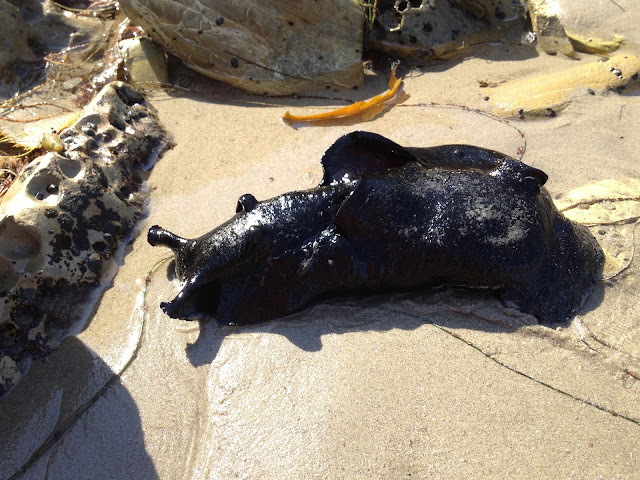 Sea hares are usually observed grazing on seaweed in tidepools during low tide, like this California brown sea hare, or waiting for the tide to rise while stranded, blob-like, on the beach, but they can also "fly" through the water with their wing-like parapodia—literally "foot wings." There's actually a third giant gastropod on the loose in Malibu: the giant limpet, which is really another type of sea snail and not a true limpet at all. This species, Megathura crenulata, is the only known member of its genus, making it a monotypic genus. M. crenulata can grow to be nearly a foot in length. It may not be much to look at, but compounds in the blood of this primitive snail apparently hold promise as a cancer treatment. According to a 2011 article in the Journal of Immunology Research, "Keyhole limpet haemocyanin (KLH) appears to be a promising protein carrier for tumor antigens in numerous cancer vaccine candidates." After a sort of gastropod goldrush in the early 2000s that ran the risk of pushing this rare animal to the edge of extinction, M. crenulata is now being raised via aquaculture techniques. 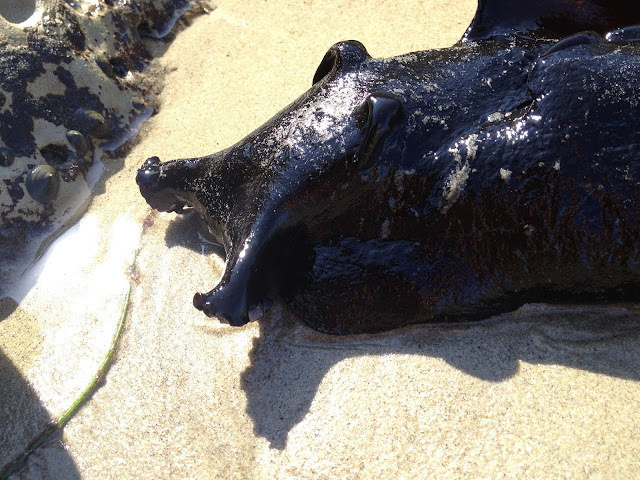 Megathura crenulata, the only known member of its genus, lives only off the coast of California. 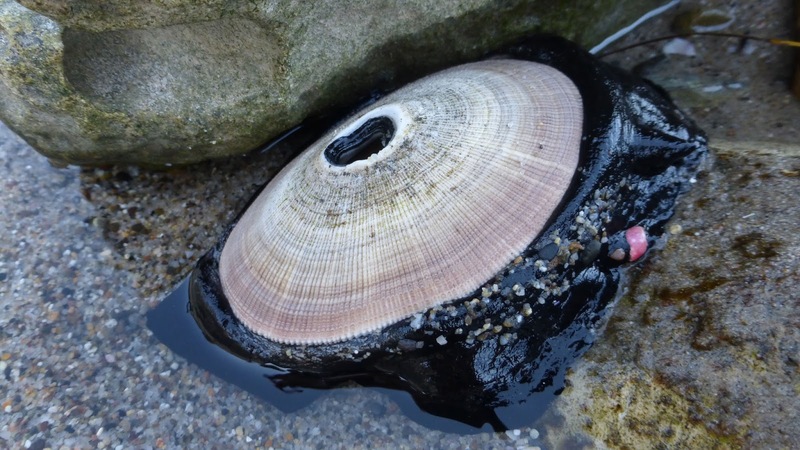 The blood of this primitive snail species has become a key ingredient in vaccine research, but the burgeoning demand for the giant limpet blood could push this poorly understood and increasingly rare species to extinction. Here's a side view of M. crenulata, suggesting a very old person shuffling along under a large umbrella, and revealing the creature's true snail nature. 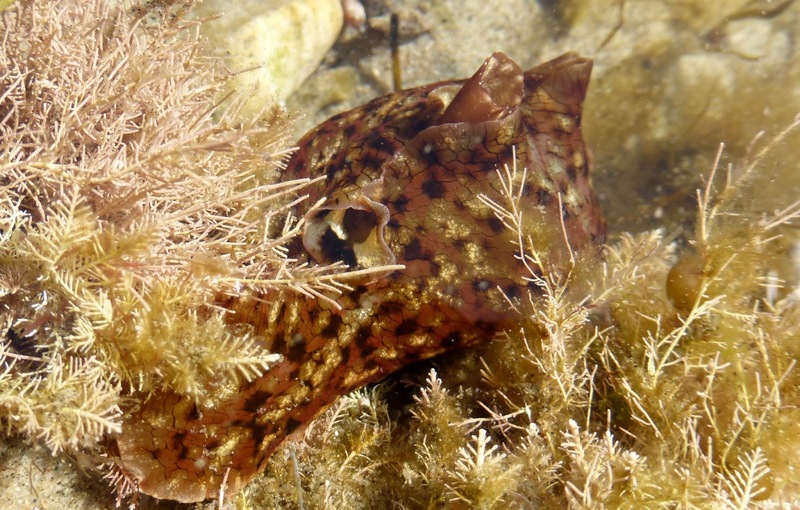 Sea hares also have a shell, but it is internal and vestigial. Sea hares are also important for medical research. According to the Aquarium of the Pacific's sea hare page, the California brown sea hare may not have a lot of brain wattage, but it has "the largest neurons in the animal kingdom, making it possible to identify individual nerve cells that are responsible for specific behaviors. They have been and are being used extensively in studying memory, behavior, and learning." Humans may not find sea hares or giant limpets lovely to behold, but there's more to Malibu's giant gastropods than meets the eye. A football-sized specimen of A. vaccaria waits for the incoming tide on the beach at Little Dume. Wow. I had no idea what this sea slug was or where it came from. 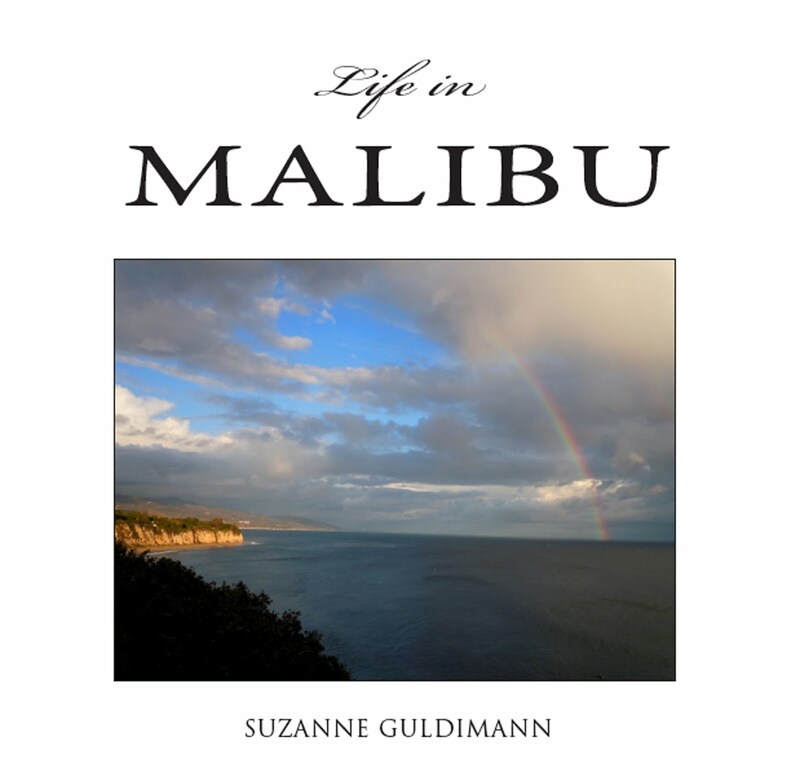 Thank you Suzanne, you never cease to amaze me with your important knowledge of Malibu's very special ecosystem.